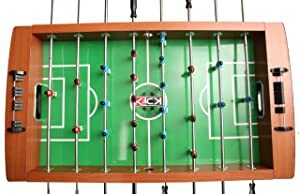 The Kick Legend foosball table is one of the best looking tables you are going to find in the market. This is the perfect game to spruce up any dreary basement or let your guests know that your game room is ready for some fun. You will have hours of fun on this table. It’s beautifully designed and has some great visual features built-in. it’s curved legs, contrasting deep chestnut brown and black construction and bright green playing field all come together to showcase a top-notch gaming table. It is very sturdy too so if you have the friends who want to come over and really “test” your gaming equipment, this is perfect to stand up to them. It has comfort features for the handles, along with a manual scoring feature on both ends. Design. This is a foosball table that can sit anywhere. Its rounded legs give it a classic look and we can see it in a variety of different settings. Bars, family rooms, or gaming centers all can benefit from the table. Layout. Its use of bright green turf with its “real” players makes it a classic foosball table. If you like a mini-field with your foosball, this is definitely the table to enjoy it on. Durable. 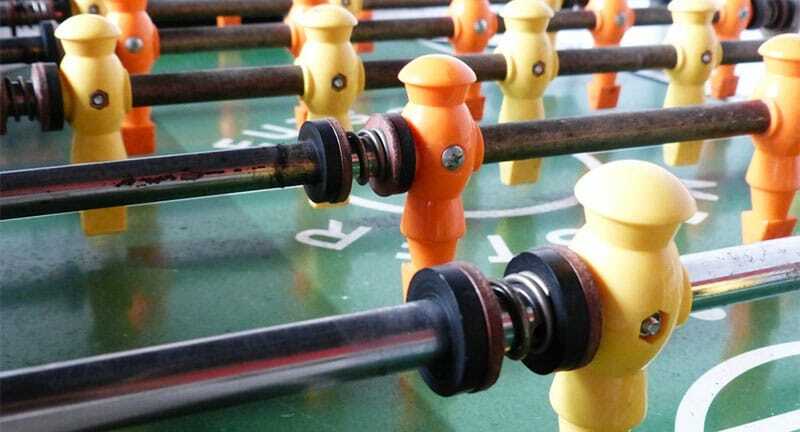 The Kick brand is known for durability and this foosball table is no different. If offers a lot of added strength for high-energy play. Size. At a whopping 55-inches, this is a table that you can truly experience foosball at its best on. Kick customer service. By far Kick offers one of the highest levels of customer care. If you have any issues with building or damage, they are a fantastic partner to have on your side. Its overall look. Again- this is a foosball table to be proud of. If you are building a state-of-the-art game room or even a bar, this table will fit in perfectly. It immediately gives off the look of intense and elegant play. We see it as being perfect for a bar. Not only is it functional, but it’s sleek and will add to the overall look of the room. Durability. Kick brand preceded itself with this model. It’s built with chrome plated rods and sturdy legs. The curves of the legs aren’t just for looks—they also serve to stabilize it during heavy-duty play. This is a table that can stand up to even the most raucous group of players. Flexibility. Kick built this table with some customizable options that we appreciate. First, it has four easy-to-adjust levelers so you won’t have to worry about an even playing field. Plus, it has a design with either 1-goalie or 3-goalies- depending on how you assemble it. This is a great feature that helps you to decide what style of play you want from the table. Gaming experience. It also offers one of the best gaming experiences that we have had on a foosball table. The reason is because of its attention-to-details. Kick made sure to put in the extras—extra-long table, well-designed players, easy-grip handles and sturdy construction. Weight. Durability can come with a price and with this table it’s the bulk. We found a few other tables that were equitable in gaming experience and didn’t come with as much weight to them. This one stands at about 130-pounds, which may be a bit much for some households. Still—if you plan on stationing it in one place and leaving it there long-term it may work well. Build. If you aren’t adept at building furniture, this likely isn’t the piece to start with. Do yourself a favor and find someone who can help. Not only will it save you time, but it can save you from having to correct errors later on. Adults. The table is one that is so elegant, it may be better suited for adults. This is why a home bar is the most probable location for it. That’s not to say that the kids can’t play—they can—but whether or not they’ll truly appreciate the elegance that was built into this table is up for debate. Larger spaces. This is a big table. Be sure to take that into account when you are considering the purchase. Yes- in return it gives you lots of play area and hours of fun, but remember that to move comfortably on each end of the table will require some space also. Smaller game room areas. 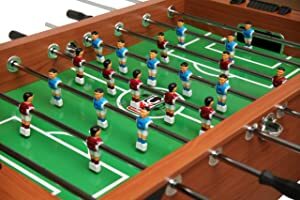 If you have limited space, the Kick brand foosball table may not be right for you. At 55-inches by 30-inches by 34-inches, be sure that your room can accommodate it. Mobility. If you plan on moving your foosball table, consider the dimensions and size of this one. It’s heavy—which necessitates at least 2 strong people to move it, preferably 3. Also- it is wide. Remember that most inner doors are 30-inches in width so if you plan on moving it, take that into account. 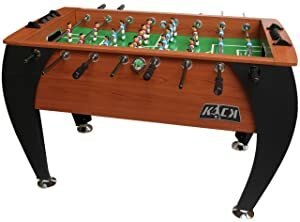 The verdict on the Kick Legend foosball table is that it is a fantastic table for the money. It’s sturdy and offers hours of endless rough play. Due to its design and construction, it’s perfect for any bar area that wants a touch of class automatically added by the furnishings. Though it is large and may require a lot of strength to move it, if you plan on having it stationed in one area of your house for the long-haul, it is still a great option. 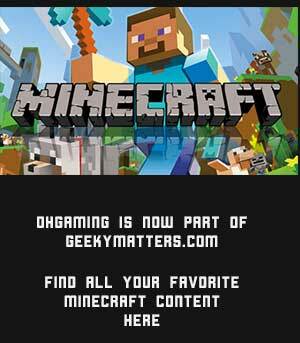 Test it out and you’ll likely enjoy how well it performs and stands up to any crowd of players.